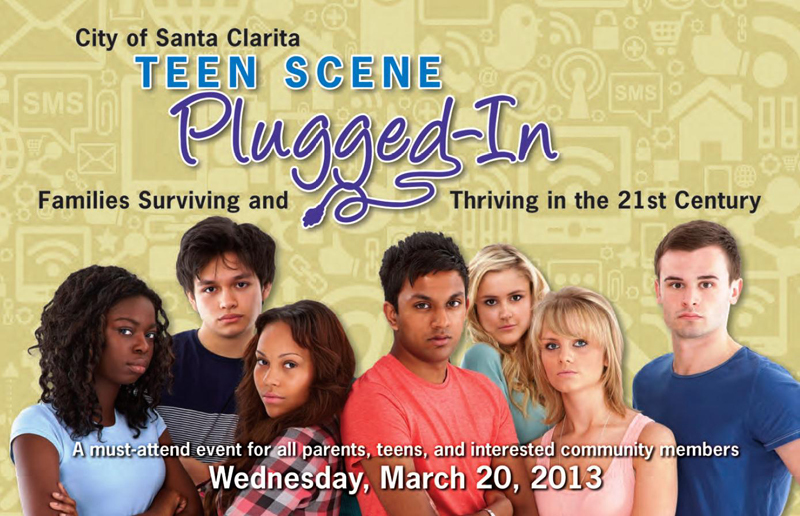 The City of Santa Clarita presents “Families Surviving and Thriving in the 21st Century” as the focus of this year’s Teen Scene Plugged-In event, which will be hosted on Wednesday, March 20, 2013 at 6:00 p.m. at the College of the Canyons Performing Arts Center, located at 26455 Rockwell Canyon Road. This dynamic and engaging program will get parents plugged in to today’s teen culture and give them tools to connect and understand their teen’s daily life. Some of the community speakers include; Andrea Fleetham, MFT Alternatives Program Staff Therapist Intern-Santa Clarita Child and Family Center; Kim Goldman, Executive Director-SCV Youth Project; Kathy Hunter, MS, PPS, Director of Student Services-William S. Hart Union High School District; and Patricia E. Patton, Ph.D., Clinical Psychologist. Each year more than 500 for teens and parents attend the Blue Ribbon Task Force’s annual event, which addresses tough teen issues and provides information and useful resources to help participants get through the crucial teenage years. The evening includes discussions on drug and alcohol use, social and academic pressure, teen stress, peer pressure, dating, family communication and connection. Prior to the beginning of the program, a resource fair will be held providing valuable tools on information for parents. The Blue Ribbon Task Force was formed in January 2000 by the Santa Clarita City Council to provide information and education to the community about alcohol, drug and tobacco use by teens. Through the years, the concerns addressed by the Task Force have grown to include other teen issues such as peer pressure, teen stress, gangs and making healthy life choices. The Task Force is composed of community-based organizations, parents, youth, educators, law enforcement, businesses and City staff. For more information on the Teen Scene program, please contact the Human Services Office at (661) 250-3708 or visit www.Santa-Clarita.com.